South Korean design company B&G know their stuff. Experts in taking old, run down apartments and turning them into something magnificent, today we are going too see an incredible before and after. This ideabook will take you on some exciting twists and turns as we discover how paying attention to detail can transform even the most disastrous of spaces. As Oscar Wilde said, To expect the unexpected shows a thoroughly modern intellect. Modern innovation is at its best in this ideabook. This kitchen is spacious, bright, clean and classic. With light wooden floors, white cupboards and counters and sleek appliances, this is a modern dream for anyone who lives in a small apartment. There is more than enough space to whip up a three course meal, enjoy a glass of red and chat to dinner guests. The open plan nature of this kitchen, with the little breakfast bar separating it from the rest of the house is very in-fashion at the moment. It truly allows for a more social space and interaction between the family who live in the home. Check out these kitchen islands to treasure for inspiration for your own home! Lighting is also key in the kitchen, as you want to be able to see what you're cooking. 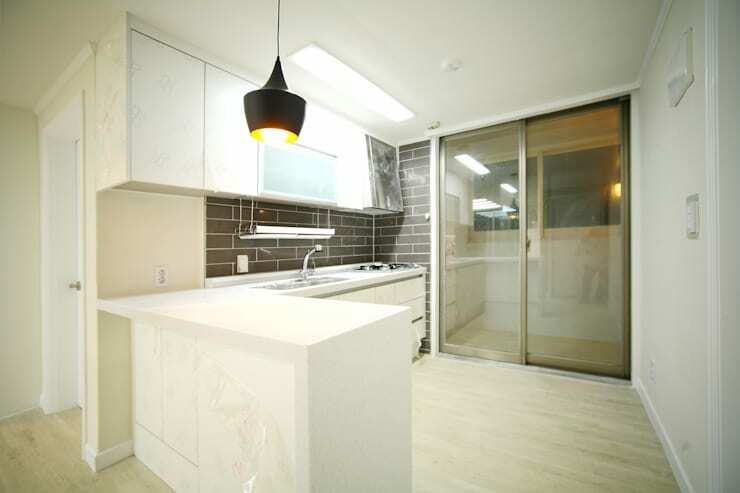 The designers have chosen a trendy, black lampshade, which is in stark contrast to the white kitchen. Before these expert designers got involved, the kitchen was old, run down and tatty. 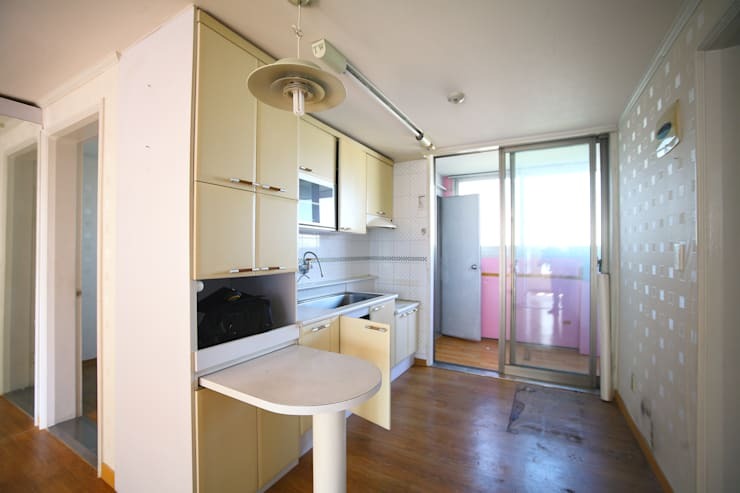 The floors are stained, the kitchen cabinets are yellowing and the design is very outdated. The ceiling lamp is an absolute no-no! Kitchen flooring should always be sleek and clean, otherwise your kitchen looks unhygienic! If you don't want to go for a light wood, like the designers have done here, opt for tiling. You want your floors to be easy to clean so opt for a material that wipes clean without too much effort. These kitchen cupboards are also in need of some love and care, whether its a lick of paint or a full on renovation. The designers have opted for the latter, replacing them with modern, new and clean white cupboards. Look after your kitchen cupboards so that you don't have to replace them too often. 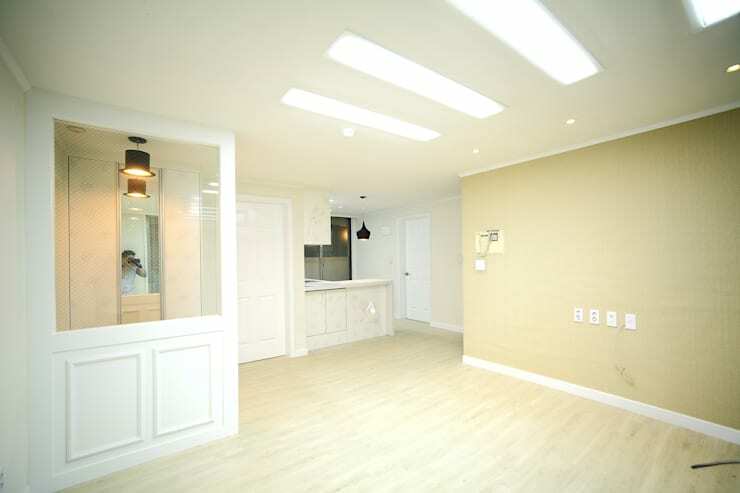 The kitchen opens up onto the living space, which is open plan as well. The designers have given the entire space a make-over, from the light wooden floors to the freshly painted walls. You'll notice that they've opted for very neutral colours—beige and white. This is a great idea as it allows whoever moves into this space to create their own look and feel with furniture and decor accessories. Anything would work here! The designers have used the dark lampshades that we saw in the kitchen in this space as well, creating a very stylish and modern edge in an otherwise simple space. Have a look through these living room products for ideas on how you would decorate this space! 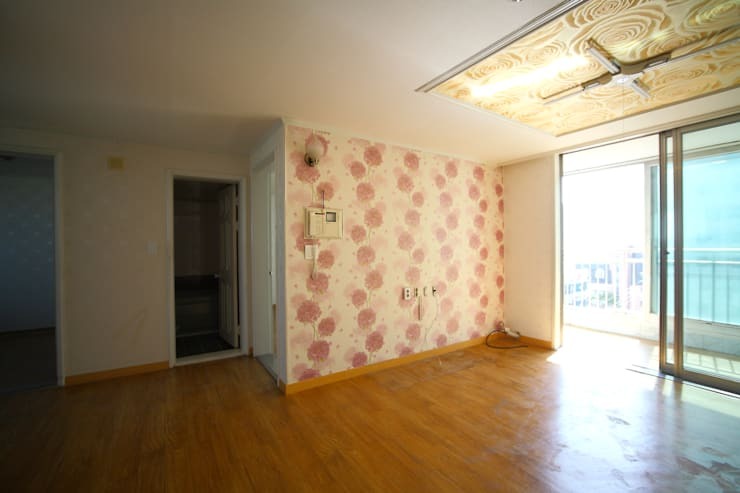 The living space before was not aesthetically pleasing to the eyes with the same old, scuffed yellow wooden floors that we saw in the kitchen, a wall decorated with tattered pink floral wallpaper and very old-school lighting fixtures. This is the kind of decor you'd expect to find in your grandmother's apartment circa 1970. The roses on the ceiling are the final straw! This is a space in desperate need of a make-over and the designers have truly risen to the occasion. Tip: If you are going to go for wallpaper, make sure that it is modern and trendy, fitting in with the overall look and feel of a space. Wallpaper can be a fantastic decor tool if done right! Read these tips on: How to make your own DIY fabric wallpaper. 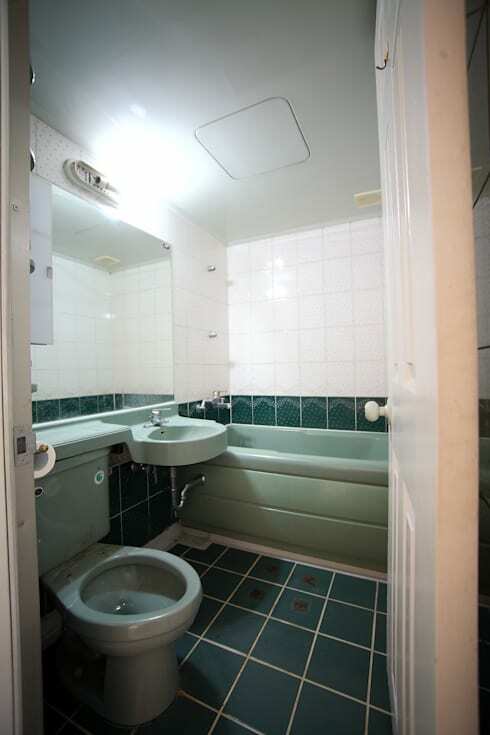 This bathroom isn't in bad shape compared to the rest of the house, but it's very old fashioned with the lime green bath, basin and toilet and the moss green tiles. When it comes to your bathroom, its better to go neutral because colours, like moss green, go out of fashion so quickly! We will see how the designers have transformed this space into a modern masterpiece. Another trick is to make use of storage space in the bathroom—behind the mirror and under the sink—so that you can keep the bathroom looking neat and tidy. The new bathroom is sleek, modern and simple—the perfect combination for a bathroom. 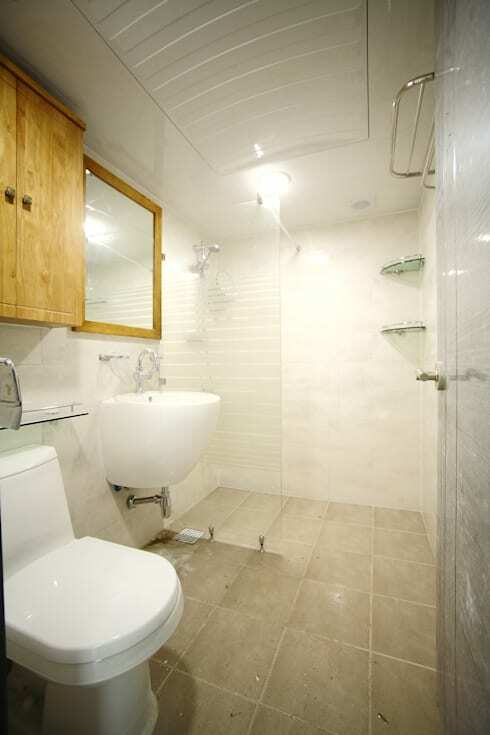 The designers have removed the bath, allowing for much more space in the bathroom. You don't want to be cramped or crowded in your bathroom so opt for a shower rather than a bath if you can't have it all. White, wood and glass are prominent colours and materials, where the designers have gone for that neutral environment that we spoke about earlier. This means that for years to come, the bathroom will remain stylish and trendy. Check out what the best materials for the bathroom are. This home is a wonderful example of how a space can be completely transformed with the right expertise. What do you think about this transformation? Did they get it right? Let us know what you think!